All registrations for Convention Delegates, Alternates and Advisors MUST be received at Department Headquarters by May 10, 2019. There will be no Convention registrations accepted after this date, nor will any be taken at the Convention except for Guests/Visitors. All registrations must be on the proper form and the registration fee is $5.00 per person, to be included with the registration form. Registration of attendees will be held Friday, May17th between 7:00 and 8:00 pm and Saturday morning, May 18th between 8:00 and 9:00 am. Each attendee must register individually at the designated registration table. This will also be the time to make any changes (i.e., Alternate becomes a Delegate) or to register any last minute Guests. Those desiring housing reservations MUST CONTACT THE HOTEL DIRECTLY and mention they are with the Sons of The American Legion, Detachment of Ohio Convention in order to receive the $89.00 (plus 13.25% tax) per night room rate. two nights would be $201.59. A credit card will be required to complete the reservation. Do not go through Department Headquarters to make your reservation. The hotel will handle reservation requests on a first-come, first-served basis. Please make sure you receive a confirmation number for your reservation. All housing reservations MUST BE MADE WITH THE HOTEL by Friday, April 26, 2019 since the room block must be released prior to the Convention. Should you need to cancel your reservation, you will need to contact the hotel directly as well. Make sure to get a confirmation number for your cancellation. The first session of the Convention will be called to order on Friday, May 17th at 8:00 pm and will include the Introduction of Guests, general convention and activities information, some Guest Speakers, and the assignment of Convention Award Judging Committees. The Saturday session will reconvene at 9:00 am and will be devoted to committee reports, award presentations, and voting on any proposed resolutions. The Sunday session will begin at 9:00 am and will be devoted to the election of officers and any other outstanding business. Prior to the Sunday morning session. a Memorial Service will be held commencing at 8:00 am. PLEASE NOTE: Our Dress Code will again be enforced this year. Legion-casual attire is acceptable for the Friday and Saturday sessions. At the Sunday session you are required to wear a coat, dress pants, shirt, and tie. All Detachment Officers are expected to wear a coat and tie at all sessions. Detachment Commission and Committee Chairmen are expected to wear a coat and tie when delivering their reports. See the enclosed forms for additional information. 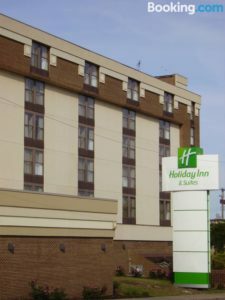 A WORD OF CAUTION: The hotel facilities are for registered hotel guests ONLY and neither the hotel nor the Ohio American Legion will accept responsibility for the personal safety / well-being of the registered guests attending the Convention.